Sushi has become a very common choice for meals these days, for its multitude of flavours and healthy ingredients (perhaps not so the fried pork cutlet with layers of fat-ladden mayo). Surprisingly, J doesn’t like sushi and I still haven’t figured out exactly why. With her new found love for prawns, I might try a prawn salad filling next time to tempt her. Except she might unpick the whole thing and eat just the prawns. Well that will be an entirely different post and I digress. One evening I served an extra dish of scallop sushi – bought from Sushi Pac as a reward for S – and J frowned and asked me what the pink coloured slices on the side of the box were. “Yes it means sometimes, some things shouldn’t break, you know, but some things then break! We don’t know what to do. That’s a pickle!” she said a matter of factly. 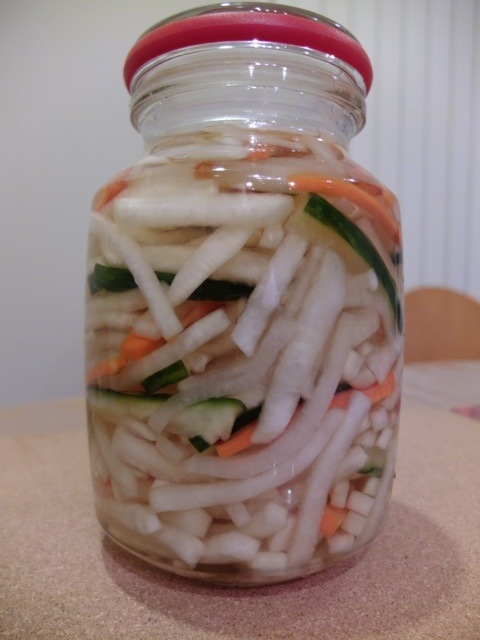 I was made speechless by that explanation, and was inspired to make some pickled turnip, carrot and cucumber. 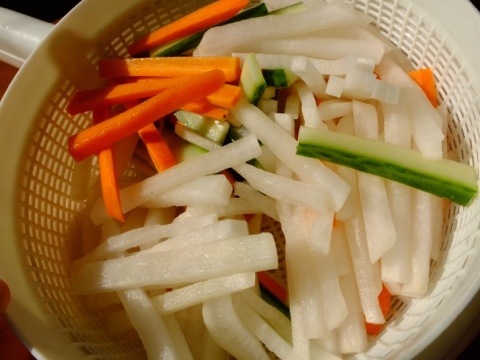 Peel the carrots and cut them into logs: about finger-length and half centimeter by half centimeter wide. Half the cucumber lengthwise and scoop the seeds out and discard. Cut the cucumber into same size as the carrots. Sprinkle about 2 tbsp of salt over the vegetables and gently massage it in. This draws the moisture content out and makes a nice crunchy pickle. Leave this in a colander to drain for 30 minutes. In the mean time, pour the apple cider vinegar into a sauce pan and bring to a boil. Add sugar in, stir to dissolve it. Turn off the heat and let it cool. Give the vegetables a good firm squeeze and use paper towels to dry them further. Put these in a large glass jar, and pour the cooled pickle solution in. Leave overnight in fridge. Serve with anything really. After all, you never know what kind of pickle life is going to throw at you.